WHAT IT IS A SUSTAINING FIRM? provides a way for you to demonstrate interest in professional engineering. clearly indicates your support of the Professional Engineer and the Missouri Society of Professional Engineers. helps to maintain and expand the high level of MSPE programs and activities, the success of which benefits both organizations and individuals. Subscription to The Missouri Engineer, the official publication of MSPE, for each authorized representative of your sustaining organization. An eighth page initial profile, at no charge, of your organization featured in an issue of The Missouri Engineer. 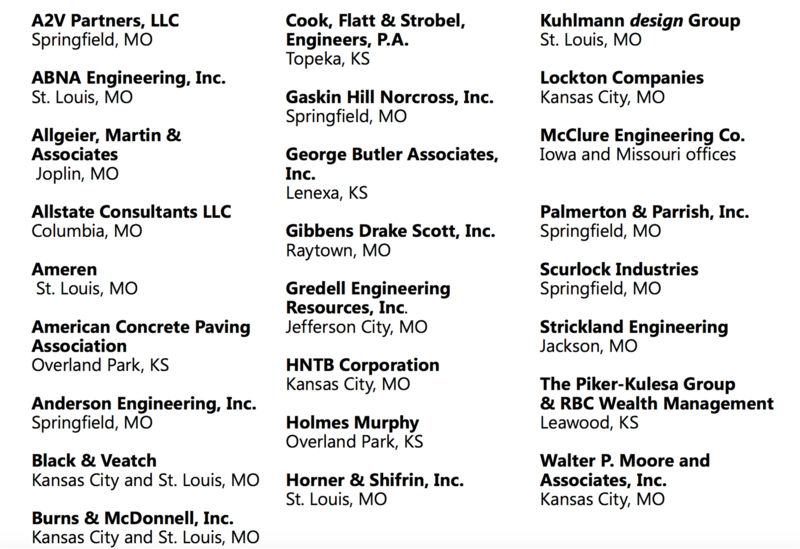 Listing in all issues of The Missouri Engineer, on our web page and a link to your company’s web page from ours. Recognition as a Sustaining Member at the local chapter level. Member rates are extended to sustaining firms for our Annual Convention and Fall PDH programs held each year. The right to use "Sustaining Organization-Missouri Society of Professional Engineers" on your letterhead . participation at the chapter and state levels in MSPE meetings and activities. Any organization, public, private or non-profit, employing members of MSPE or engineers eligible* for membership in the MSPE, may be a Sustaining Organization. * A licensed professional engineer (PE) or engineer in training (EIT) in Missouri or other states where criteria meet licensing requirements in Missouri is considered eligible. Any organization, public, private or non-profit which does not employ engineers but is interested in the professional objectives of engineering and those of MSPE. For more information and/or an application, contact us at 573.636.4861 or by e-mail.